Quick, easy, low-fat and flavoursome, this recipe also saves on the washing up, which makes it a winner in my book. It makes a good weekday supper, especially on those days when you’re feeling a bit guilty for over-indulging. You can substitute smoked haddock for the salmon and use any vegetables you like, as long as they’ll cook in the same time as the salmon. Try a combination of carrot batons, baby corn (halved lengthways), asparagus tips or sliced courgettes in addition to the ones mentioned below. Try to mix and match the colours as well as the flavours. 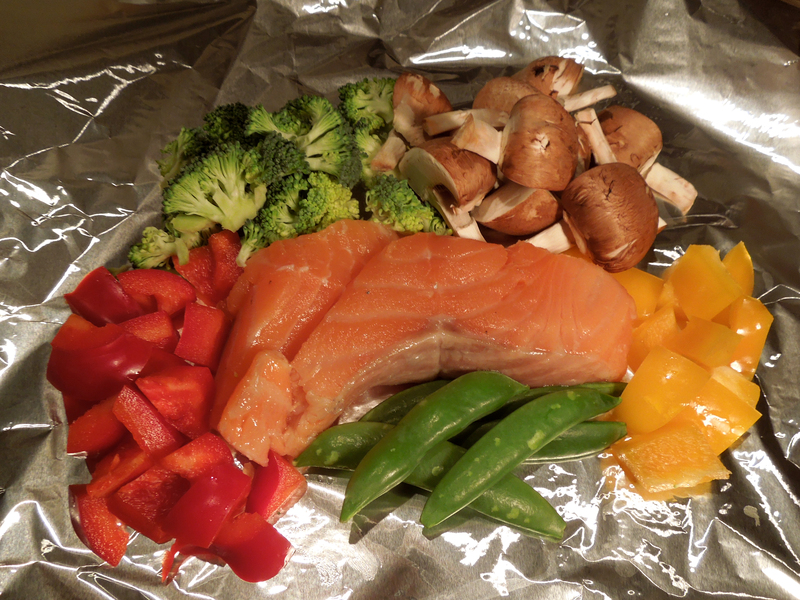 Cut two large squares of kitchen foil and place the salmon fillets, skin side down, in the middle. 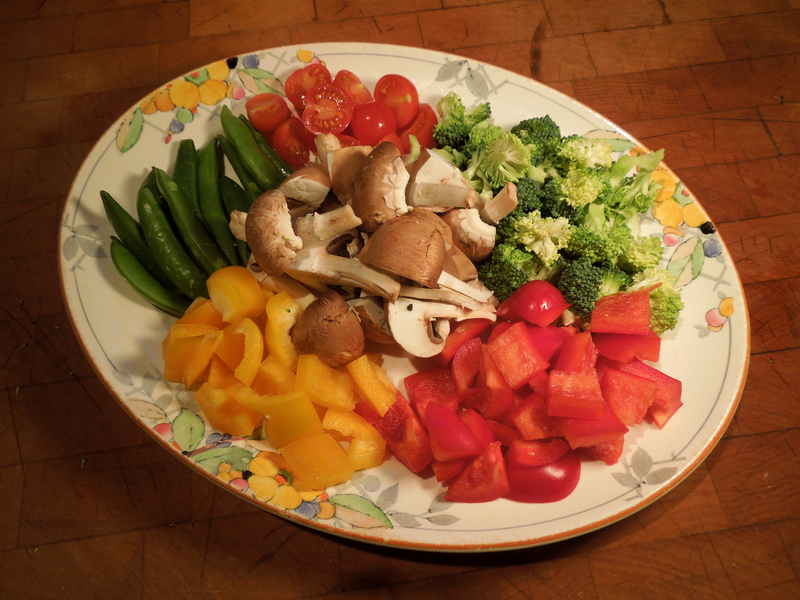 Arrange the vegetables (except the tomatoes) in separate and contrasting piles around the edges of the fish. 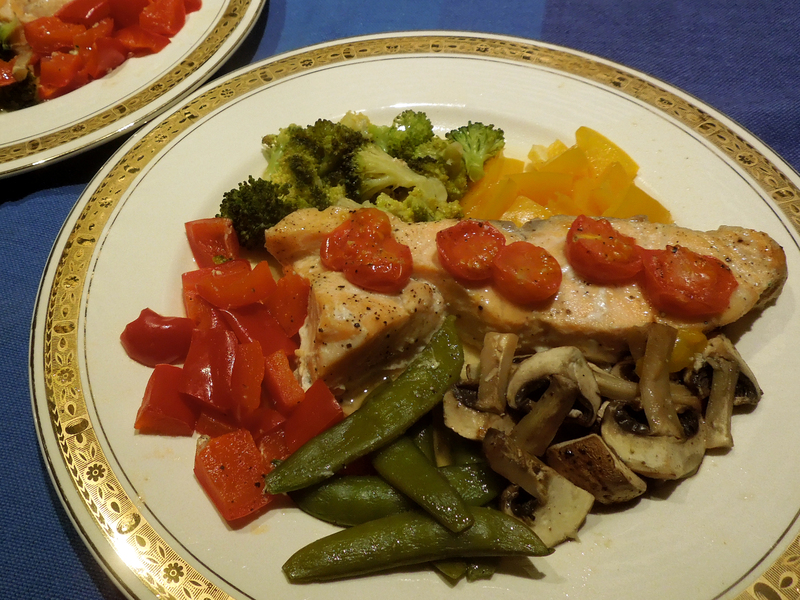 Put the cherry tomatoes, cut side up, on top of the salmon fillets. Season to taste and squeeze over a little lemon juice. Bring up the edges of the foil to make loose packages and and crimp the edges to seal. Put them in a big roasting tin and cook for 20-25 minutes or until the salmon and veg are done. In theory you should to be able to serve this by slitting the base of the parcel and emptying it onto a plate, but in my experience this results in scalded fingers and a big messy heap of food. It’s easier to carefully open up the package and neatly remove the contents to your warmed dishes, pouring the pan juices over the fish. 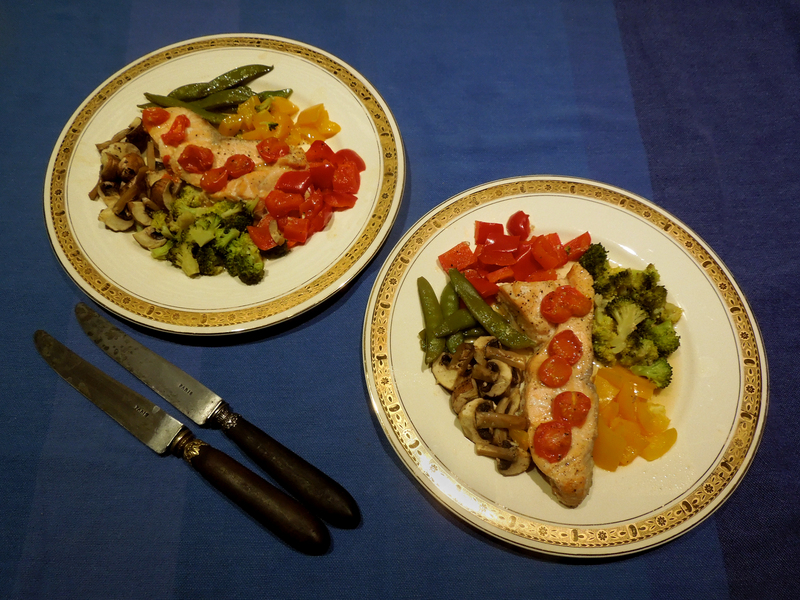 This entry was posted in Fish and shellfish, Mains and tagged diet recipes, low-fat recipes, quick suppers, Salmon Parcels, steamed fish and vegetables parcels by Linda Duffin. Bookmark the permalink. This is one of my favourite ‘go-to’ ways with salmon. So easy, until as you say, it comes to unwrapping. Scalded fingers and soggy napkins guaranteed. Worth the small inconvenience though!